Up to 100% of roof area can be flat. Cover for all ages of flat roof. Be fully waterproofed with drainpipes and guttering to ensure proper water drainage. The waterproofing should extend up adjacent walls by at least six inches. Have a thermal layer of fibreglass, polystyrene or other insulating material inserted above the roof decking. ‘Warm’ roofs require a robust vapour control layer (VCL). ‘Cold roofs’ must include adequate ventilation. Be constructed to resist wind forces and be protected from sun damage. Why is it hard to insure a flat roof? A roof that is entirely flat may suffer from pooling of water in wet weather causing damp and leaks that lead to water damage in the property. And, in some cases, flat roofs can put you at a greater risk of burglary as it is easier for thieves to gain entry to your home by standing on the roof to access windows. This is why many home insurance providers won't cover flat roofs and you need to get a quote for flat roof insurance from a specialist like us. A common issue with roofs of any type is correctly identifying the problem when things go wrong. And, more often than not, that means stopping water from getting in. Usually, if under 30% of your roof is flat then you should be able to source cover without any real issues. Even so, getting home insurance for flat roofs doesn’t need to be difficult. HomeProtect can provide flat roof home insurance online. Approximate percentage of the roof that is flat: 34-50% vs 51-75% vs 76-100%. The material with which the flat roof is covered. The year that the flat roof was last inspected. Approximate year that the property was built. Property history, such as flooding, structural movement, subsidence and underpinning. Regular maintenance is the key with a flat roof. Start by making your own regular spot checks, especially after a period of wet weather, to catch problems before they set in and then call in a flat roof expert every few years. Some providers of flat roof house insurance require proof of regular inspections to demonstrate that the roof has been kept in a good state of repair, so remember to ask for documentation. You could need this if you make a claim for water damage. 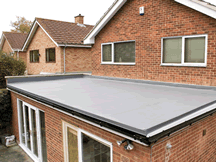 Full cover for all types of flat roofs, including asphalt, EPDM, tiles, lead, GRP and eco roofs. Discount available for combined Buildings and Contents. Alternative accommodation if your house becomes uninhabitable. Which type of flat roof is best for you? I'm building a flat roof on my new extension, how does this affect my home insurance? It's important that you tell your home insurance provider that you have a new extension and that the roof is flat as it may affect the cover available under your policy. The HomeProtect policy will cover you for flat roof damage and any resulting damage to the room and belongings housed beneath the flat roof, just as long as you have told us about the flat roof, and that it is regularly checked and maintained. How often should I get my flat roof assessed? It is recommended to get your flat roof inspected by a professional every 5 years. You can have the survey carried out by a qualified builder, roofer or surveyor. You will need to provide documented proof of the inspection and any repair works in the event of a claim. Why do insurers associate flat roofs with higher risk? Flat roofs have a tendency to leak. This is particularly the case when flat roofs are not laid correctly or when they have been neglected for some time. Regular maintenance of flat roofs is often a condition of your insurance policy. I don’t know how much of my roof is flat, how do I find out? If you have recently purchased a property with a flat roof then you should be able to find out how much of it is flat by referring to the home buyer’s survey for specific measurements. Alternatively, you can have a survey carried out by a qualified builder, roofer or surveyor and ask them to calculate the percentage of the roof that is flat. It’s important to have this information to hand when taking out a quote so as to be able to secure accurate cover for your property. To get a quote, you need to know which bracket your flat roof fits in to: 0-33%, 34-50%, 51-75% or 76-100%. Not many companies that will cover houses with a full flat roof, these do and the cover is not overly expensive. What makes a house non-standard? Get your flat roof home insurance quote online now!